Volumes 1 to 5 of the JOURNAL OF THE SOUVENIR BUILDING COLLECTOR SOCIETY are now available for download in the Membership section of the website. Members Only / SBCS Newsletters / Listing of Back Issues. Go to the bottom of the page. Jay M, Michael E, and Joe K have contributed photos from the 2015 Convention that can be viewed at Members Only / Convention Photos / 2015. Roll over caption to get full captions. If you have pictures to share, please forward them. Also, check out the public tab, 2015 Convention Redux. We’ll keep it up for a while and could use some photos. We could use some more pictures of buildings and monuments acquired during the convention to post and increase the number of buildings that will come up in a internet search. 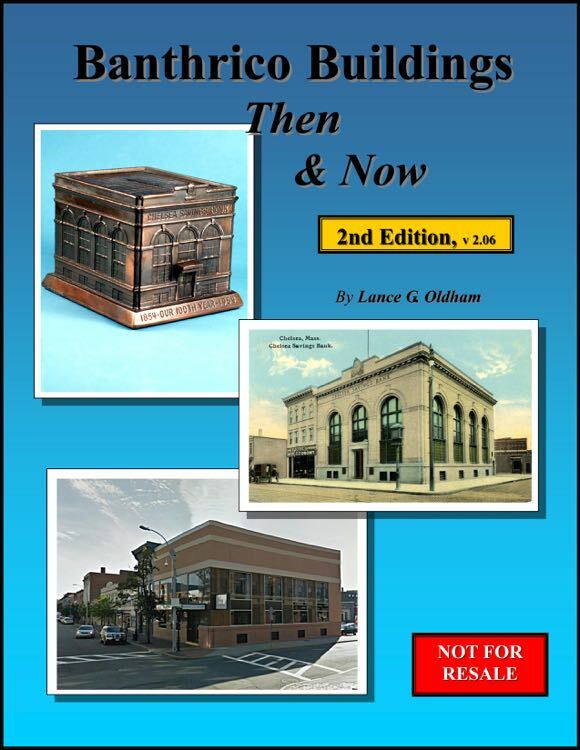 Lance Oldham’s definitive work Banthrico Buildings, Then and Now. Check it out and download it for your research files. Photos and descriptions of your souvenir buildings / monuments / statues with a Los Angeles City, Los Angeles County, or Orange County location. We will start posting some of these photos as a run-up to the June 10 – 12, 2016 SBCS Convention in Los Angeles. A further intent is to create a locale (LA and Orange Counties) specific checklist for members. Email your photos to bookendcollector@bookendcollector.com. Head over to the Souvenir Building Collectors Facebook page and keep the conversation lively. Elizabeth L. and Joe K. took advantage of the “First to Fly” promotion for the Orlando EYE and got the birds-eye view of the Orlando countryside. Joe took 2 flights and received 2 commemorative “First to Fly” pins. Joe said, “While there is not that much to see while up in the sky (after all, it is in central Florida – not on the edge of the Thames), there are several worthwhile sites to discover and see from a different perspective”. View of Central Florida from high up on the rotation of the Orlando Eye. Katherine and Jerry tickled Frank Lloyd Wrights’ fancy. Donna S. picked up 2 keys to the 1933 Century of Progress, Chicago’s World Fair, at an antique mall in the city of Winter Park. Of course, the keys had buildings depicted on them. Keys to the 1933 Century of Progress, Chicago World’s Fair. Gray Metal, 8 1/2″ and 10″ in length. On his way out-of-town, Joe K. found a $1 treasure at the Belville Corner Old Time Market in Bushnell, FL. The Swap and Shop tables, the after dinner raffle, and the auction yielded more treasures for the 2015 convention attendees. 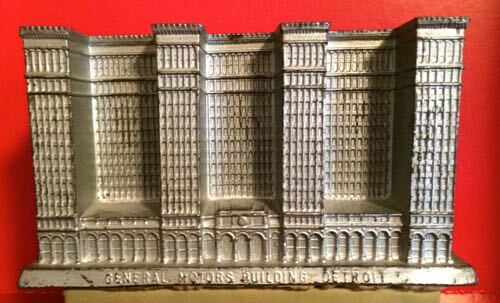 Even a bashed up General Motors, Detroit, MI miniature building is all good if you don’t have one in your collection. Grey metal, 3 1/2″ in height. 2015 SBCS Convention is IN THE BAG! The Souvenir Building Collectors Society 2015 Convention in Orlando, Florida is in the bag. The next gathering will be June 10-11-12, 2016 in Los Angeles. As SBCS members trickled out of Orlando, they carried bags of memories and packed suitcases of small buildings. SBCS 2015 Commemorative, Orlando City Hall, pewter, Height 2 1/4″, Width 3″, Mfg. Infocus Tech. Early arrivals were treated to a walking tour of historical downtown Orlando, which included the SBCS & SBCCA Exhibit of miniature buildings in the Orlando City Hall Rotunda. This exhibit runs until May 9th. SBCS Attendees caught up with each other at our hosts’ Meet & Greet soiree. Many shared stories of their newest or their special souvenir building finds. More memories were added to the bag with the fantastic tour of one of the largest collections of buildings by the architect Frank Lloyd Wright at the Florida Southern College campus in Lakeland, FL. Just in case you get lost! One member found a photo of a cast metal model of the the Annie Pfeiffer Chapel that was sold to raise money for building the chapel. Have you seen one? The Swap Meet on Saturday gave everyone a chance to trade, sell, or buy souvenir buildings. More treasures were added to the suitcases with the annual auction and raffle. It was hard not to go home with more real estate! Tie the proverbial string around your finger! Or just make a list or a note to yourself! Don’t forget to bring your Show-and-Tell buildings. Bring your Bidding Strategy and Dinero (Cash) for the Saturday Night Auction Action. Remember to pack some goodies to donate for the raffle. Be prepared to Swap and Shop at the annual SWAP Meet on Saturday morning. Hospitality Room (in hotel): Where you can pick up Registration Packets and drop off Raffle Items. Wed. 3 – 5 PM, Thurs & Fri. 10 AM – 12 Noon, and in afternoon. City of Orlando Walking Tour: Conducted by members of the City of Orlando Historical Society. Will end at City Hall for SBCS Exhibit of Souvenir Buildings. 8:30 AM Friday – Meet in hotel lobby. A quick tour will be offered to late arrivals in the afternoon and end at the City Hall SBCS Exhibit. Meet & Greet: Light Dinner and Dessert with Hosts Marty and Jakob. Venue for Show-and-Tell with a theme of “recent finds or super favorite finds.” Sign-up in Hospitality Room for Shuttle or Car Pool. Walkable Distance. Early Evening Friday. Parthenon Gift Shop, Nashville, TN. Southern Elegance and Cake in shape of Parthenon. SBCS Dinner and Raffle 2014. Oh so many choices. Meet for breakfast then onto personal interests – Cape Canaveral to Hogwarts, Antiques to Disney World. What an Opportunity! Be one of the first to ride the Orlando Eye! The 2015 Souvenir Building Collectors Society Convention from May 1 – 3 in Orlando is on the same weekend that tickets first become available for the Orlando Eye. Tickets can be purchased for the “First to Fly” promotion by clicking on this link to the ORLANDO EYE. Act NOW! Tickets are going fast! 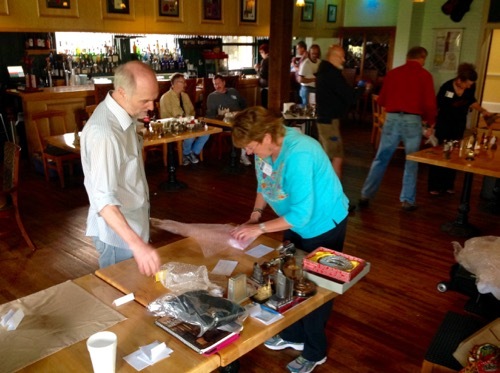 The Souvenir Building Collectors Society meeting is in Orlando, FL on May 1, 2 & 3, 2015. Click here to be taken to the website page about the 2015 Convention. Click here to visit THE BUILDING COLLECTOR’s website and post on the SBCS Conventions’ Commemorative miniature buildings. Click here to see the listing of the SBCS Convention locales and activities. Space Shuttle on Crawler Transporter, Kennedy Space Center, FL. 7 1/2 ” in height. Gray Metal. Seven (7) more days to register and receive a discount to the 2105 SBCS Convention in Orlando, Florida. Twenty-two (22) days to the opening of the SBCS Exhibit of Souvenir Buildings at the Orlando City Hall. Twenty-seven (27) days before Souvenir Building Collectors begin arriving at the Embassy Suites – Downtown Orlando. Twenty-eight (28) days before a meet-greet-eat soiree at Marty & Jakob’s. Twenty-nine (29) days before the Business Meeting, SBCS Swap Meet, Bus Tour to Lakeland, SBCS Dinner, Auction, and Raffle. Thirty (30) days before some SBCS members head to Cape Canaveral for a peek at the Kennedy Space Center. Click here for Convention Information and Links. Excitement is building (pun intended) for the 2015 SBCS Convention, May 1 – 3, in Orlando, Florida and for an outstanding exhibit in the Orlando City Hall of miniature buildings from collections across the USA. Come enjoy the assemblage! Register for the convention before April 10, 2015 and save $20 on your registration fee. Click here for the Registration Form. Reserve your room at the Embassy Suites Orlando – Downtown (800-809-9708, ask for the “Souvenir Building Collectors Society” rate) before Friday, April 3, 2015 to receive the special convention rate. Click here for the Embassy Suites Website. Click here for the Convention Schedule. See you on May 1! Page 118 from “Souvenir Buildings, A Collection of Identified Miniatures” by Dort Fratzke Brown, Copyright 1977. Seminal publication of miniature buildings. It is just 2 months until the 2015 SBCS Convention in Orlando, Florida! Among the activities scheduled is a field trip to Lakeland to view one of the largest collections in one place of Frank Lloyd Wright buildings. Other events include a tour of the SBCS Presentation of Souvenir Buildings Exhibit in the Rotunda of the Orlando City Hall, a visit to the home of a souvenir building collector, and the annual auction and raffle. To read about Florida Southern College and the Frank Lloyd Wright connection visit William B. Carpenter’s website at http://www.franklloydwrightatfsc.com. 1. Get your hotel reservations. The rooms are going quickly. EMBASSY SUITES Orlando – Downtown. Phone 800-809-9708. Ask for Souvenir Building Collectors Society special rate! 2. Get your souvenir buildings for the City Hall Exhibit to Marty by March 14, 2015. Click here for more information about participating in the City Hall Exhibit. Also, you can email Marty at jakobchevy@bellsouth.net. 3. The newsletter is coming out soon with updates and registration material. We will post the Registration Materials after the Newsletter is available. ONE: Members-Only Section Password has been reset as of February 2. Paid members will have received the new password for accessing the Members-Only sections of the website. Click here to see the full process. 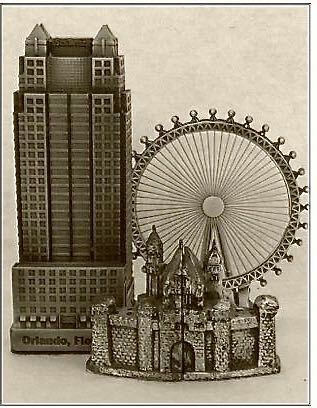 TWO: Organizers are seeking souvenir buildings for the SBCS Exhibit of Souvenir Buildings at the Orlando City Hall. If you plan to submit any of your collection for inclusion now is time to get pictures and information to Marty G. —— ASAP. Instructions for submission can be accessed by clicking here. THREE: Start your planning for the 2015 Souvenir Building Convention, May 1 – 3, in Orlando, FL. The Convention Hotel is the EMBASSY SUITES ORLANDO – DOWNTOWN. Make your reservations by April 3, 2015 to receive the special convention rate. RESOLUTION 1: Attend the 2015 SBCS Convention in Orlando, May 1, 2, and 3. Click here to be taken to the 2015 Convention page. RESOLUTION 2: Provide ONE or more souvenir buildings for the SBCS Display in Orlando City Hall Public Exhibit. SBCS Members click here for more information regarding the exhibit.